The Tricycle Theatre asked the UK Jewish Film Festival (UKJFF) to reconsider its sponsorship by the Israeli Embassy, and offered to replace the £1,400 from its own funds. The UKJFF rejected the offer and withdrew, then went to the press with the story it had been banned. On 5 August the Tricycle issued a statement in response to ‘misleading information’, clarifying that ‘at this moment, the Tricycle would not accept sponsorship from any government agency involved in the conflict. We hope to find a way to work with the UK Jewish Film Festival to allow the festival to go ahead at the Tricycle as it has done so successfully for the past 8 years.’ In the statement, Director of the National Theatre Nicholas Hytner commented ‘It greatly saddens me that the UKJFF have unwisely politicised a celebration of Jewish culture and I deplore any misrepresentation of the Tricycle’s position.’ This Guardian report gives some of the background. By Friday 8 August, the Guardian wrote in its main editorial (under the heading ‘The Guardian view on Gaza and the rise of antisemitism‘), that ‘to demand that Jews surrender that connection [to Israel] is to tell Jews how they might – and how they might not – live as Jews. Such demands have an ugly history.’ The editorial then appeared to conflate the Tricycle’s request to the UKJFF with firebombing synagogues and death threats to Jews. By Tuesday 12 August a Tory councillor in Brent, John Warren, whose council provides around a quarter of the Tricycle’s funding, announced an ‘investigation’ into whether the theatre had compromised its charitable status. It emerged that Arts Council England had already clarified that Tricycle’s decision on sponsorship had not breached any of the rules they would apply to Arts Council funded organisations. The original Tricycle statement about the UKJFF, which included statements of support from several leading theatre figures, is no longer on the Tricycle website. However, the Jews sans Frontieres blog has recovered it and published it here. When the UKJFF opened, there was an unprecedented political presence at the gala. 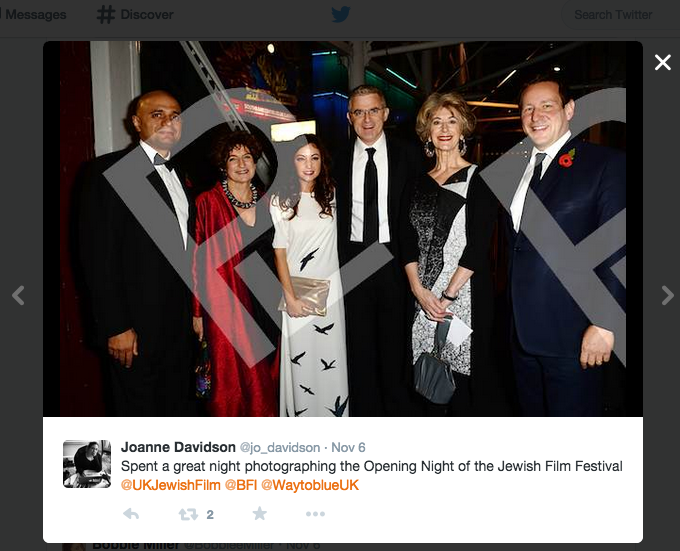 This image encapsulates the relationship between the UK Department for Culture, Media and Sport, the Israeli Embassy in London, and UK Jewish Film. From left to right: Sajid Javid, Judy Ironside, Nelly Tagar, Daniel Taub, Maureen Lipman and Ed Vaizey.